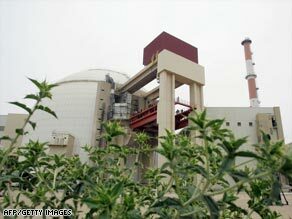 Iran’s first nuclear power plant will undergo comprehensive testing Wednesday in front of Russian and Iranian officials, Iranian Students’ News Agency reported, quoting a nuclear expert. Reza Khazaneh, a former adviser to the head of Iran’s Atomic Energy Organization (IAEO), told the semi-official news agency the tests will be carried out using “dummy” fuel rods without enriched uranium. All of the Bushehr plant’s systems will be tested, including its main units, auxiliary peripheral systems and initial circuits, ISNA said, quoting Khazaneh. If these tests are successful, Khazaneh said, “then the next tests, with fuel rods containing enriched uranium, will take place near the end of 2009,” ISNA reported. Russia’s nuclear power equipment and service export monopoly, Atomstroiexport, is building the plant under supervision of the International Atomic Energy Agency (IAEA), the United Nations’ nuclear watchdog agency. Bushehr’s completion has long been delayed. Sergei Kiriyenko, head of the Russian Federal Atomic Energy Agency, and Gholam Reza Aghazadeh, head of IAEO, will attend the testing on Wednesday, IAEO spokesman Mohsen Delaviz told ISNA on Monday. ISNA also reported that Iranian and international journalists have been invited to cover the event. State-run television aired reports about Wednesday’s testing and praised Iran’s progress in nuclear technology. The United States, several European nations and Israel suspect Tehran has been trying to acquire the capacity to build nuclear weapons, but Iran says its nuclear program is solely for peaceful purposes.